Gain 1credit for each installed connection resource. A job is only as strong as the weakest link. Thankfully Ms. Jones is always on time. This can be a viable option in any deck that takes advantage of a number of Connections, though to really make it count, you need at least three of them installed - otherwise, Easy Mark is the card you want. It's a contextual thing - probably won't be much of use against an agressive, resource-trashing Corp deck (now that we have The All-Seeing I, the risk is even worse). 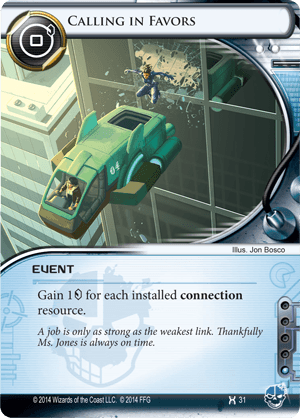 The Criminal faction currently has a number of cheap and disposable Connections you can utilize in your deck to make this card usable.